The effects of fracking make themselves visible in Oklahoma [Image: Lenzy Krehiel-Burton/Reuters]. Here in the UK, we can look forward to all of this. Fracking is on its way, with the first contracts already signed – thanks to the Conservative Government’s short-sighted, backward-facing environmental and energy policies. We don’t need to tie ourselves down to fossil fuels in order to power our world any more. We already have electric cars, and vehicles powered by hydrogen fuel cells. For power generation, we can have micro power generation. Small wind turbines, solar power and gas capture, run by ordinary people rather than huge corporations – and benefiting us immediately as well. It isn’t pie-in-the-sky. It’s here. But it won’t make money for Tories so they would rather ruin our environment instead. 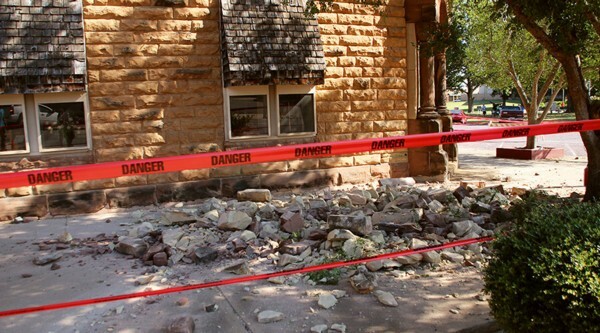 Property damage, reduced property values and emotional distress resulting from a record-breaking September earthquake are all claimed in the lawsuit, which does not specify any sum total that the 27 fracking companies would pay if found liable, according to the Associated Press. The class-action suit filed Thursday in district court points to the natural gas extraction method of fracking, or hydraulic fracturing, which consists of injecting wastewater into the earth, as the cause for not only the major quake, but also 52 subsequent tremblors. “reckless disregard for public or private safety.” The beloved Cons and their tame pundits, bent lobbyists and tame paid for experts would never let this happen in the UK. They listen closely to those who voice against their frackin buddies, have years of frackin expertise as a Government (Not!) and will still plough on irregardless of what negative news comes from the States where frackin has raped the environment recklessly. Yup your safety, like the NHS, is in safe hands.